Urban Horse Promotes a Set of 4 x Old Macs / Easyboot Trail Inserts - Set of 4 x inserts is enough to cover a pair of Old Mac / Easyboot Trail hoof boot! 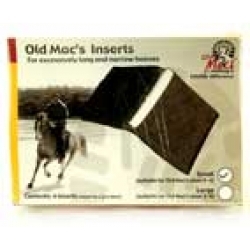 Old Mac inserts are designed to fit long and narrow hooves and provide extra security if needed. Generally only recommended if the width and length are more than 4 sizes apart, but sometimes it is necessary to use them especially behind if the horse has a tendancy to twist their hind feet on contact with the ground.